A brief look at the United State’s first National Park. It was nearing peak fall in the American North West when I decided it was time to get out. I flew into Bozeman, Montana one morning, rented a bunch of camera equipment, and set up for the next day. I took a time-lapse video of the sunset before I slept. Woke up at 4:30; in the car at 6am. The sun rose at 7:50am in Yellowstone National Park, and the light was warm and soft. What followed was an intense two day mission through Wyoming and South West Montana. Here are some results. Bison are the most frequently seen animals living in the park. An average of 3,000 bison roam the grass covered valleys and rolling hills of Yellowstone. Approximately 50 million animals roamed the western ranges of North America before the introduction of European settlement. The sun rises behind a Douglas Fir tree. A bull moose proudly passes through his native habitat in northern Yellowstone’s Lamar Valley. Grasslands of the Lamar Valley. Bison graze just feet away from slow driving tourists. A passing grizzly bear left these tracks near a small, geothermal lake in the Lower Geyser Basin. An adolescent black bear scavenges for food. A single cloud forms above Grand Teton peak. 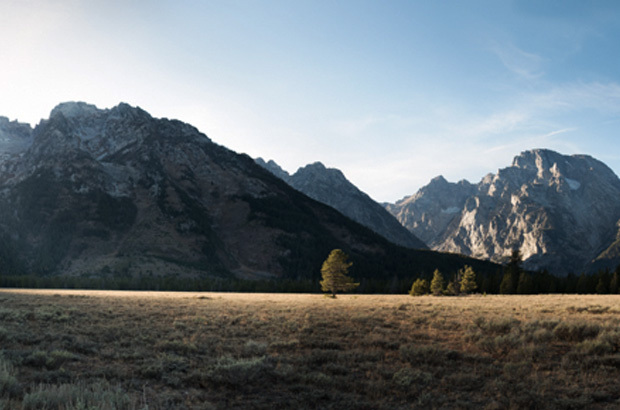 The Teton Range is the youngest mountain range in the Rocky Mountains. This entry was posted in american folklore, Features and tagged montana, national park, sean gannon, yellowstone on November 12, 2012 by A Crew.